While it is true that when most people think about the great state of Wisconsin, cheese and great lakes are a few things that spring to mind. It turns out that the Wisconsin Dells is a water park lover’s dream land, especially in the cold winter months. 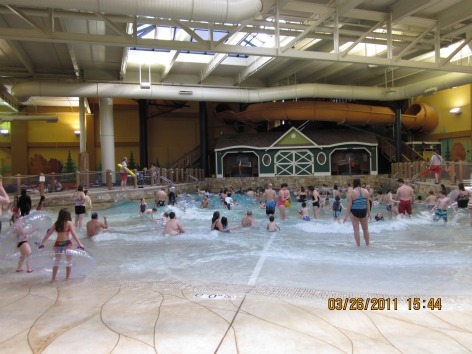 While the area in and around the Wisconsin Dells is filled with more than 20 resorts which boast some of the best water parks in the world, the Great Wolf Lodge Wisconsin Dells stands out for several reasons. 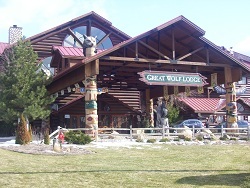 The Great Wolf features a giant indoor water park with four separate areas appropriate for children of all ages. 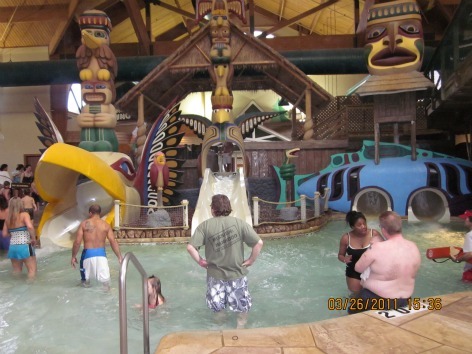 This was our third mini-vacation with the kids to the Great Wolf Lodge. We were able to save some money watching for coupons. We found a great special and booked a 4 night stay this summer. If you can book any of your stays here during the weekday, you will find much easier access and smaller crowds at the water parks. We keep coming back to the Great Wolf Lodge because we find it to be a great place for families with young children. The resort is just about the right size for us, as we can easily walk to the water park from our room with the kids. Plus, they offer many additional activities for young families beyond the water parks. We always seem to find the resort clean and well kept, and the staff seems to care about being friendly with their customers. The Great Wolf Water Park boasts 300,000 gallons of pure excitement with a total of 19 humungous waterslides, 6 pools one of which is a wave pool, a lazy river, a giant water fort, and so much more. And if you think that the park is only for summer then think again. When the snow is thick on the ground and the lean wolf of winter is howling at the door you can still have the water park vacation of a lifetime at the Great Wolf as much of the park is enclosed and climate controlled. That’s right; the water park is a whole lot of family fun and excitement even in the dead of winter! But the Great Wolf Lodge Water Park is very exclusive, so if you want to come and play, you need to be an overnight guest at the resort. Check-in for is at 4 p.m., or as rooms become available. Check-out is at 11 a.m. However, you can arrive early and stay late in the water park. Just pre-check-in and get your wrist bands for the water park. You can arrive as early as noon and stay late on the day of checkout. We arrived here around mid afternoon and the kids wanted to check out the indoor water park right away. 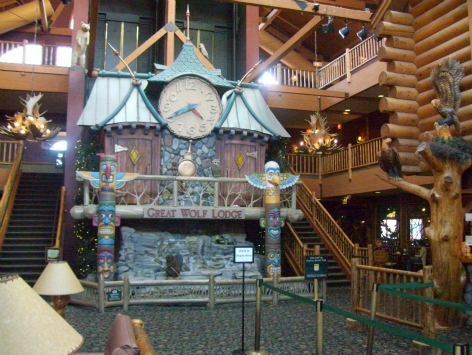 Even after three visits, we still comment to each other that the Great Wolf Wisconsin Dells lobby is very welcoming with the rough hewn wood logs, several exotic animal heads from around the world, a beautiful stone fireplace, and an ornate clock tower. We actually try to spend some time in the lobby just taking in the scenery and to get a little relaxation. For those times when outdoor play is a fun idea, you can enjoy the 120,000 gallon Thunder Bay pool, which offers plenty of activities for the whole family including a zero level wading area for the little ones. Mom and dad can relax in the warm summer sun while the kiddies enjoy activities such as water basketball and all that fun with the water geysers and sprayers. The kids wanted to spend most of the time at the indoor park. We did manage a few hours at the outdoor park, and I must say, it was quite relaxing for Mom and Dad. There were plenty of chairs and tables available, so we enjoyed some relaxation time as the kids went swimming in the big pool area. 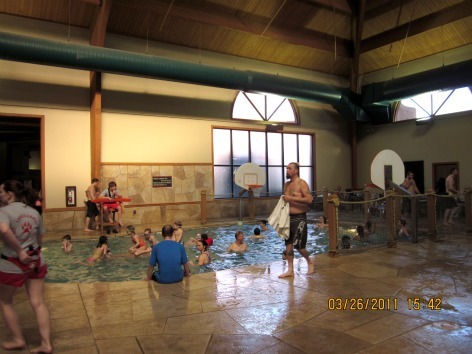 The main attraction at Great Wolf Lodge is definitely the indoor water area. From a family’s perspective, we really liked that the water park was all in one area, yet was set into three separate and distinct sections. It has a wonderful toddler area for our youngest child to have fun without being overwhelmed by older kids. The water park was really fun and had lots of variety for all ages with a wide assortment of pools, rides, and slides. There are plenty of tables and chairs and of course towels are provided at the park. The area is very clean and not over crowded, as the water areas are only available to hotel guests. We also could not help but notice that the lifeguards were excellent, very vigilant and professional. Here are some of the water features at the park. Totem Towers is a part of the indoor water park area, and has several rip roaring water slides. Ride alone or drag a family member along on the doubles for plenty of awesomely wet entertainment even when it is snowing outside! 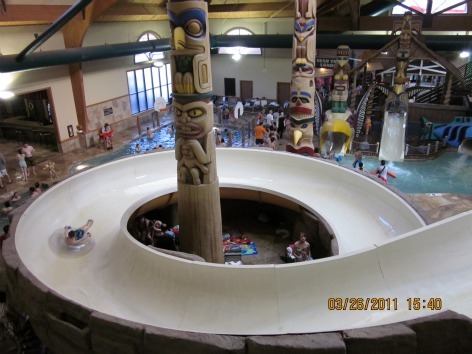 Probably the most exciting ride in the Great Wolf Lodge water park. Up to 4 people can take a massive tube and then drop into the 6-story funnel that will repeatedly swish and swirl you up and down the sides of the funnel, before making a wet entry. Grab your inner tube and ride ocean waves up to 3’ tall. This gigantic wave pool features zero-depth entry and goes up to 5 feet deep. We were really surprised at how nice the wave pool was and spent a lot of time there. The fort is one of the main water features in the park. This is a four story interactive tree house adventure in the center of the indoor water park. Hold on tight as you navigate slippery suspension bridges, treetop slides, swing from cargo nets, and lie in ambush to start a water war at the soaking spray stations. If this doesn’t get you wet, just wait for the alarm bell and the 1,000-gallon tipping bucket. The countdown and the big bucket over turning was very exciting for the all the kids. 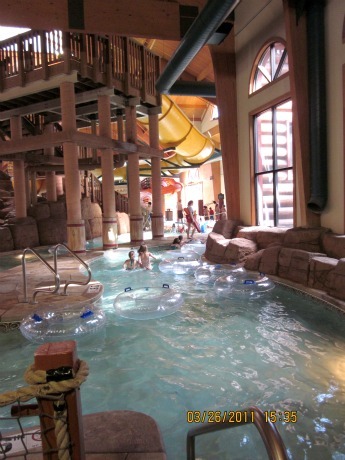 Crooked Creek is a lazy relaxing ride where the current will sweep you all along the indoor winding river. A must for all parents! Enjoy the heart pounding 200 foot drop down this tube slide right into the lazy river ride. This is an outdoor activity pool area where you can play a fast and rousing game of water basket ball or see if you can balance on the “Floating Beaver”. View Great Deals Mom and dad will really enjoy the jumbo size whirlpools - one for adults 21 and older - and another for the whole family. They were always full so get in and get your seat early and often. View Great Deals The younger guys and girls will enjoy the kiddie water areas, including Hawk's Beak, Raccoon Lagoon, and Gushin' Geyser for the "48 inches and under" sized among us. In order to enjoy the Gushin Geyser, you must be accompanied by a small child of no more than 48 inches tall. That’s right, the fun and excitement of the erupting water volcano wild and wooly adrenalin rush of the interactive wading pool is for young people only at the Great Wolf Lodge. I hope you’re not afraid of the dark. This 436-foot enclosed slide will twist, turn and loop back and spits you into the splash pool. This is a river crossing challenge full of fun for kids of all ages. Kids practice their balance as they jump from lily pad to lily pad, or use the netting to guide themselves across. One missed step and ... you are wet! Challenge your friends to a fun sliding competition on the competitive mat racer waterslides. You launch yourself headfirst down the 4-story slide with sharp turns before finishing in a straightaway. Go single, or double tube and spin down this 443 foot water slide. 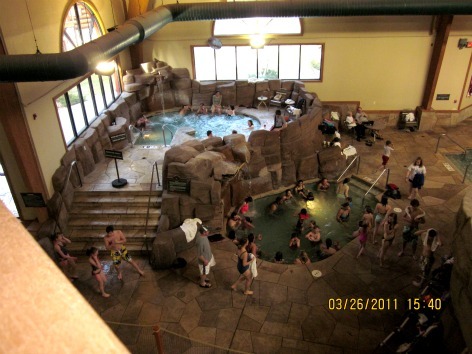 Are you tired at the end of a long day at the Great Wolf Lodge park but not ready to wind down yet? Then head on over to the Northern Lights games and arcades area for a little friendly competition. With over one hundred exciting game options you can collect your tickets and walk away with the prize of your choice. For the younger kids, don’t miss the fun and exciting programs and activities available. Our children had an amazing time here doing crafts at the cub club. The craft leader was very nice and we made some great keepsakes to take home. Three times a day they put on an animated show at the clock tower in the front lobby area. 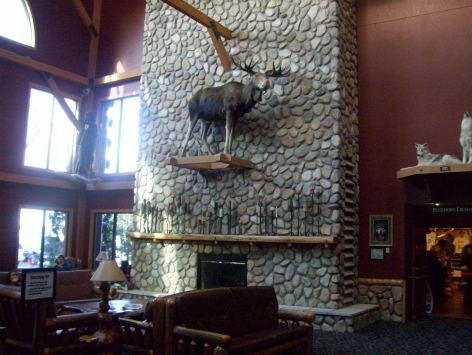 When the clock in the lobby of the Great Wolf Lodge strikes certain times of the day, the forest creatures in the clock come to life. View Great Deals If you have enough energy left, the fitness room is open 24-7 . They offer three treadmills, an elliptical trainer, recumbent bike, and several weight lifting machines. We did not have enough time, but we did take a quick walk through of the Spa Salon. The spa specializes in much needed stress reduction and relaxation for us adults. Someday! I would describe MagiQuest as a new version of an innovative virtual scavenger hunt with a lot of imagination. 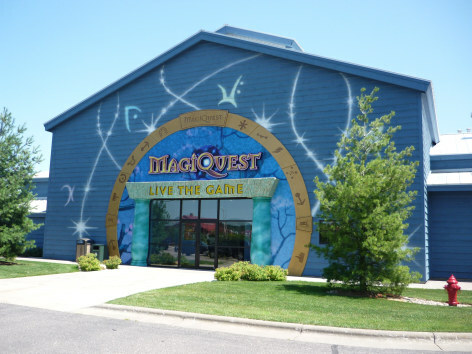 Maybe another way to describe MagiQuest would be that instead of playing or watching a video game you are more like an interactive part of the game. 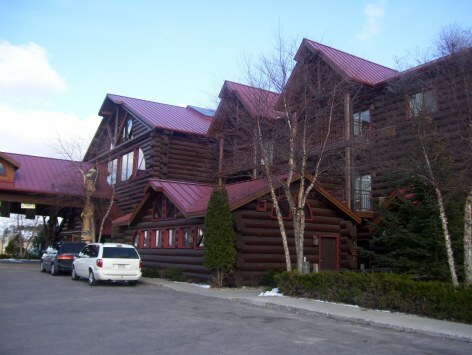 It is very convenient, as it is directly connected to the Great Wolf Lodge. We thought this activity was worth the money and is something that you do not encounter everywhere. This is a very unique activity game for kids over 5 years of age. We had a very enjoyable time, both adults and children equally. The Tanger Outlet Mall is a short walk or drive across the joint parking lot. 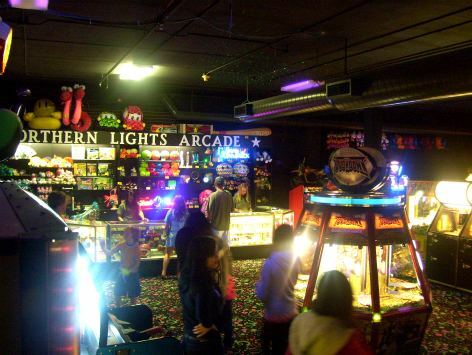 It is also near Knuckleheads, an indoor entertainment center with bowling, rides, and lots of games. We also went on the Original Duck tour that was easy to get to with a shuttle that comes to the resort. And there are several fast food and sit down restaurants in the area. 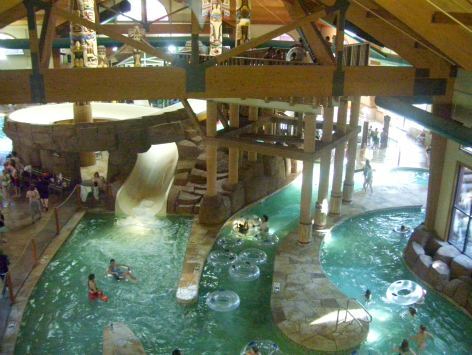 There is so much more to the Great Wolf Lodge water park that we simply do not have the room to list them all. With your stay at the Resort, all the wet and wild fun will make for a vacation of a lifetime, and is especially nice when the snow is thick on the ground.